Headline specs on the D7200 include a 24.2Mp APS-C sensor, EXPEED 4 processing engine, new weather-resistant shell, as well improved autofocus and image buffer performance. 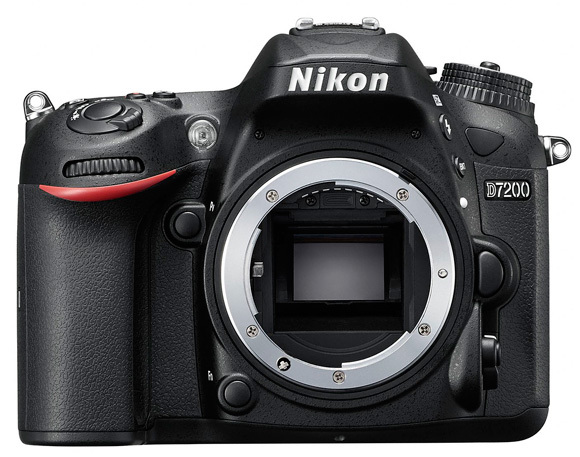 For a full overview of the D7200’s specifications & features, check out our Nikon D7200 Preview. 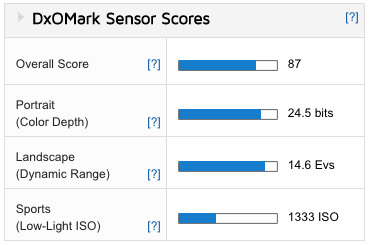 With an overall DxOMark Sensor Score of 87 points, the Nikon D7200’s 24.2Mp sensor ranks in 20th place for all sensors in the database and in first place for APS-C sensors. Despite using a 24.2Mp sensor similar to those in the D5500 and D3300 models, there’s clear daylight between the D7200 with 87 points, and the D5500 in second place for APS-C sensors with 84 points. Continuing to dominate the top of the APS-C leader board, Nikon DX-format DSLRs now occupy the top 5 spots, with overall scores from the D7200, D5500, D5200, D7100, and D5300 all breaking through the 80 points barrier. The D7200’s outstanding area of performance is undoubtedly Dynamic Range, where its Landscape sub-score of 14.6 EVs not only ranks first for all APS-C sensors, but also second for ALL sensors in the database, just behind the full-frame Nikon D810 with 14.8 EVs. 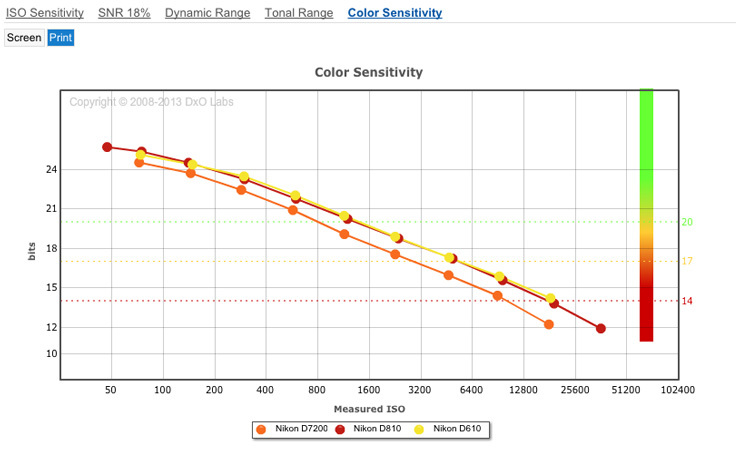 With a Portrait Color Depth score of 24.5 bits, the D7200 also sits on top of the table for APS-C color. The result isn’t quite as impressive as its Dynamic Range, however, with comparable results from the Sony A77 II, and the Nikon D3300 & D7100 only a little behind for color. The one area in which the D7200’s sensor performance falls down a little is ISO, however, where its score of 1333 ISO ranks behind the D5500, the D3300 and the D5300, and the two Sony cameras, putting it in sixth place overall in the APS-C rankings, although there’s really not very significant. 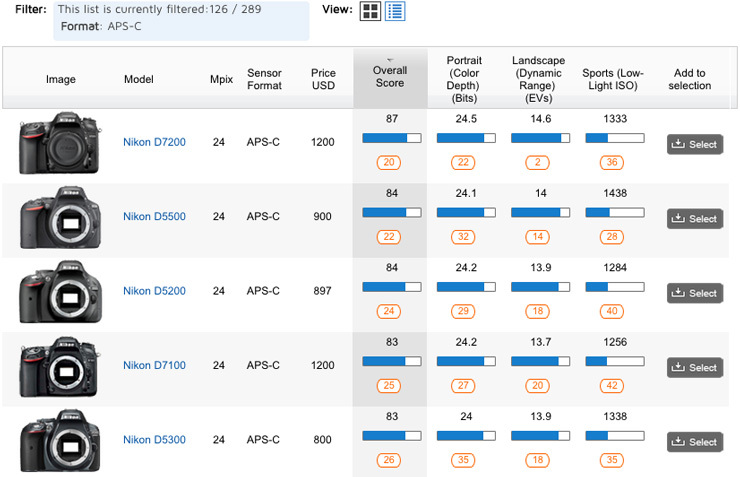 Nikon DSLRs using the 24Mp sensor now occupy the top 5 spots for APS-C sensor image quality in the DxOMark database, with the new D7200 leading the way with 87 points. 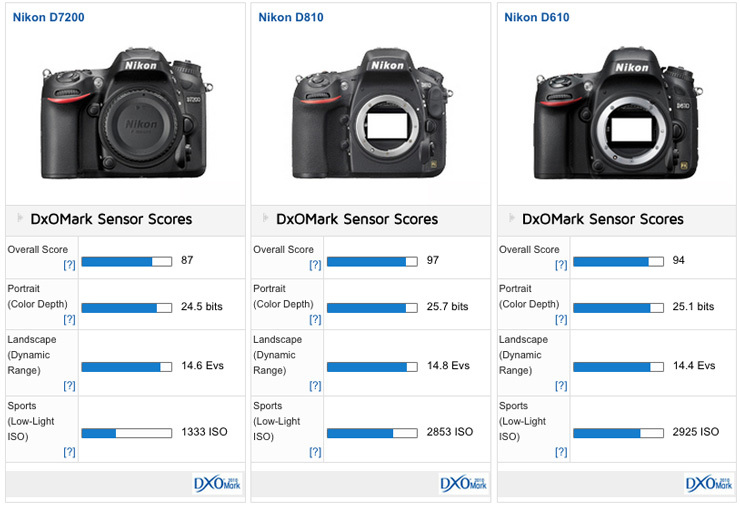 The class-leading APS-C sensor scores from the Nikon D7200 mean that results from the smaller DX format are getting ever closer to the best full-frame sensors. Despite being a little way off from breaking through the 90-point barrier, an overall score of 87 from the D7200 is only a half-stop behind the Nikon D610 with 94 points, and two-thirds of a stop off the best-performing sensor we’ve tested (the D810 with 97 points). The big difference between DX and FX sensors is still in their Low-Light ISO performance, where the physically larger sensor and greater pixel pitch results in over one-stop better sensitivity for the larger format. 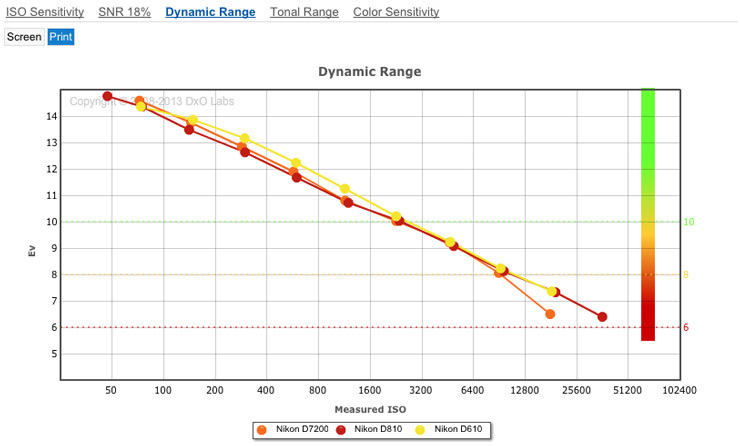 Results are closer for Color Sensitivity and Dynamic Range, however, putting the D7200’s sensor performance in the same ballpark as the D810 and D610 for these sub-scores. The D7200’s outstanding Dynamic Range score of 14.6 EVs actually surpasses that of the D610 at base ISO, and is only 0.2 EVs behind the D810. As sensitivity increases, the rate of decline in Dynamic Range is broadly similar, too, with all three sensors offering good Dynamic Range of over 10 EVs up to ISO 3200. For Color Sensitivity, the larger FX formats are superior at base ISO, but with overall Portrait scores of 24.5 bits for the D7200 compared to 25.1 bits & 25.7 bits for the D610 and D810, respectively, the difference is less than one stop. As sensitivity increases, the gap between the APS-C and full-frame sensors for color widens a little, however, so while good Color Sensitivity over 20 bits is possible on the D810 and D610 up to ISO 1600, the D7200’s APS-C sensor tails off at ISO 800. At base ISO, Color Sensitivity scores aren’t too far apart, but as ISO sensitivity increases, the gap widens, with the FX-format sensors offering around one stop better color over ISO800. Results are closer for Dynamic Range, however, where the D7200’s excellent performance generally keeps pace with the results of the D810 & D610 until the very highest sensitivities. Head-to-head against the flagship APS-C DSLR competition from Canon and Sony, the D7200’s class-leading Sensor Score offers one-third of a stop better performance than the Sony A77 II (82 points) and over one stop better performance than the Canon 7D Mark II (70 points). The Nikon D7200 leads the way in the three sub-scores, too, but against the Sony A77 II there’s very little difference in Color Sensitivity, with scores of 24.5 bits vs 24.4 bits for the Sony. Low-light ISO results between the flagship Nikon & Sony DSLRs are close, too, 1333 ISO vs 1013 ISO, but the D7200’s outstanding Dynamic Range score of 14.6 EVs is almost a whole stop better than the A77 II’s 13.4 EVs. Against the Canon 7D Mark II there’s very difference again for ISO (1333 ISO vs 1082 ISO), but it’s worth noting that the D7200 still manages to achieve a better ISO result despite the greater resolution of the Canon sensor — 24.2Mp vs 20.2Mp. Portrait scores of 24.5 bits vs 22.4 bits puts the Nikon D7200 over one stop better than the 7D Mark II for Color Sensitivity, but for Dynamic Range, the Nikon is miles ahead with its score of 14.6 EVs — almost 3 stops better than the Canon with 11.8 EVs. All these results are at base ISO sensitivity, however, and a more detailed analysis of Dynamic Range shows the gap between the three flagship APS-C sensors narrowing as sensitivity is increased. 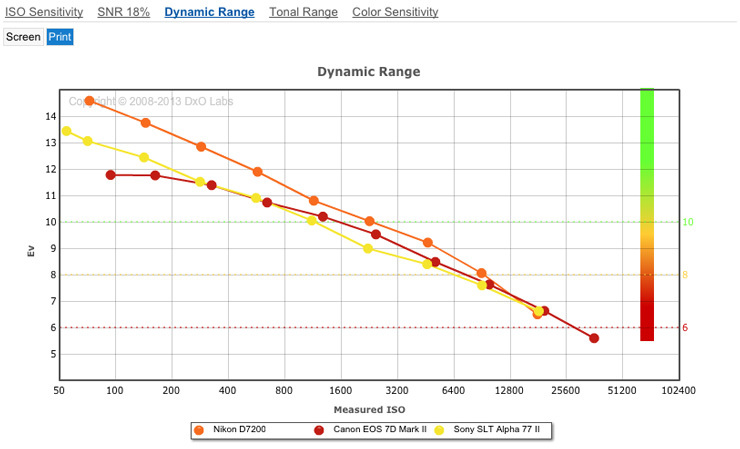 The decline in Dynamic Range performance is steeper on the D7200 as sensitivity increases, particularly compared to the 7D Mark II, which has a much shallower curve. The D7200 still offers good Dynamic Range of over 10 EVs up to ISO 3200, however, compared to the A77 II and 7D Mark II, which drop below 10 EVs at ISO 1600, meaning that the D7200 is a stop better at these higher sensitivities. In fact, it’s only when you get to the top sensitivities of ISO 12,800 & 25,600 that Dynamic Range results from all three sensors become the same, so the Nikon D7200 has the advantage at most ISO settings, but its real strength is at base ISO. 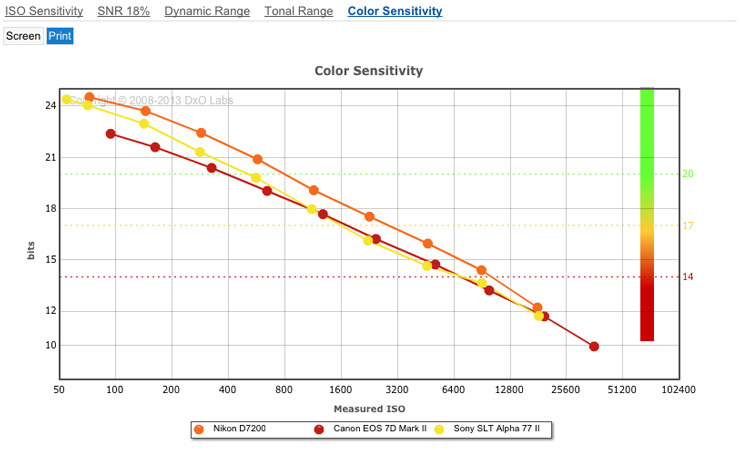 Against the 7D Mark II, the D7200’s better Color Sensitivity is again most pronounced at base ISO, but the rate of decline is more consistent as ISO sensitivity is increased. You can see from the Color Sensitivity curve that the D7200 continues to offer around one stop better color than the 7D Mark II at all sensitivities up to ISO 12,800, when the gap starts to narrow. It’s a little different head to head with the Sony A77 II, however. Both the Nikon and Sony offer similar levels of color at base ISO, but the D7200 manages to sustain it better as sensitivity is increased, so between ISO 400 and ISO 6400, the Nikon offers around one stop better color. At base ISO, there’s not much between the D7200 & A77 II for color, but the D7200’s color holds up better as ISO sensitivity is increased, and is consistently better than the 7D Mark II. At base ISO, Dynamic Range on the D7200 is miles ahead, but declines quicker than the 7D Mark II and A77 II when ISO is increases, reducing its advantage to around one stop at ISO 1600. 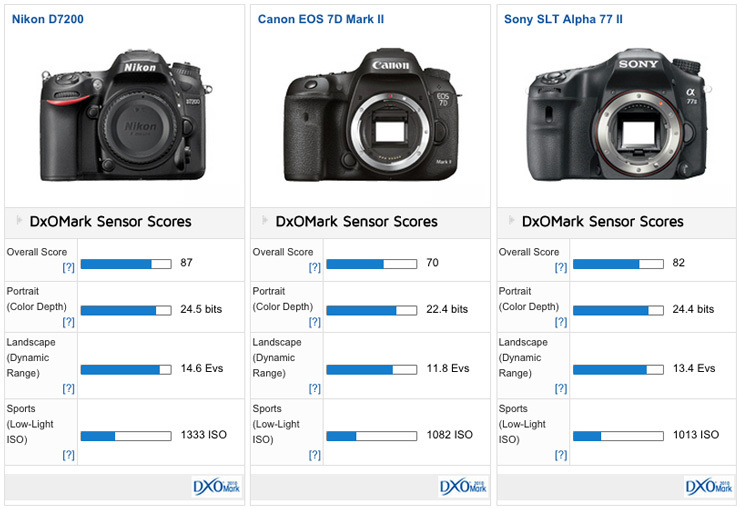 So we have a new DxOMark champion for APS-C image quality. With an overall DxOMark Sensor Score of 87 points, the Nikon D7200’s 24.2Mp DX-format sensor is starting to knock on the door of its full-frame siblings for image quality. Its ISO performance still can’t compete against the larger FX format, but its outstanding Dynamic Range at base ISO is on apar with the bigger sensors, and its color isn’t too far behind either. The outstanding image quality, combined with improvements to the D7200’s build quality (including a new weather-resistant shell), and its better performance thanks to its pro-grade Multi-CAM 3500 AF II autofocus system and bigger image buffer, make the new Nikon D7200 a very attractive APS-C shooting solution.